Billed as the Last Great Race on Earth, the Iditarod International Sled Dog Race could more aptly be billed the world's most notorious and controversial competition. It is a 1,000-plus mile charge across Alaska that requires a good dog team, a musher who understands his or her dogs -- what they can and cannot do -- and a great deal of luck for victory, not to mention a willingness to push to the physical and mental limits of exhaustion. The men and women and dogs who run the Iditarod are a tough lot who mush through their own pain and illness, as well as whatever the late Alaska winter offers. Critics say the mushers drive their dogs to death, but I investigated those claims for the Atlantic in March 1995 in "The Perilous Iditarod." I wrote a history of the Alaskan husky for Natural History in March 1996, "The Making of a Marathon Mutt," and I followed the race, start to finish, in a Cessna Super Cub. I have not seen anyone actually drive their dogs to death. I'm not sure you could anyway, because if a dog or dogs are in distress, they will quit, refuse to run. People caught abusing dogs are thrown out of the race. That is not to say that human error and negligence have not caused the death of dogs in the Iditarod. They have, and that is not excusable. But the deaths are the result of individual actions or inactions; they are not caused by the race. Dogs have also been felled by hidden health problems and enraged moose. Fierce opponents of the race often are so emotional that they will tolerate no other perspectives, but it is worth noting that per capita, more dogs have died in my neighborhood because of human negligence and error in the past 20 years than have died in the Iditarod. Mushers want healthy, fit dogs, and so the Alaskan husky is healthier and better socialized than the vast majority of purebred house dogs. I have written before of my support for the Iditarod, and I don't plan an extensive rehash here. But I will posit that the allure of the race is also the source of much of the confusion about it. The race traverses a vast, beautiful, varied landscape, crossing the Alaska Range before plunging into the interior and finally meeting the mighty Yukon River and heading for the west coast, Norton Sound. Probably more people have actually run the Iditarod than have witnessed it first hand, which can only be accomplished by small plane or snowmobile -- at no small cost. Most people's knowledge of the race comes from news reports or television summaries in the days when it was televised. As a result, it is fairly easy for people who have seen only a little of the race to claim an expertise and knowledge they lack. I followed the race by air in 1997. This year I am following it virtually, having purchased an Insider's Subscription from the Iditarod Trail Committee for $33.95. That gives me the GPS location of all mushers, their standing in the race, their current and average speeds, and the miles they have covered. Between that and assorted blogs, photos and videos, I can reconstruct in my mind just where the teams are, having been there myself. Without those or some similar touchstone, it is difficult to imagine what it's like to be on the runners of a packed sled, the brake not catching on the bare frozen ground -- a problem early in this year's race -- with 16 fit, trim dogs wanting to pull at top speed. If you avoid a crash you are lucky, and something like a dozen of the 69 mushers who started the race -- some of them seasoned veterans -- did not make it across the Alaska Range because of conditions like that. Now the race leaders are on the Yukon and soon will be crossing to Norton Sound where they turn north and head for Nome. It appears for now that four-time champion Martin Buser controls the race, but it is hard to say that with certainty. He took his 24-hour rest after a bold dash across the Alaska Range at the start of the race, a strategy that appears to have given him a four to five hour lead -- substantial, but not enough to insure victory at this point in the race. The Iditarod is built around rest -- a mandated 24 hour stop anywhere in the race and two 8 hour stops, one on the Yukon and one on the coast at White Mountain, the next-to-last checkpoint. Mushers must check in at every checkpoint for a mandatory veterinary examination of their dogs, even if they don't stop to rest. 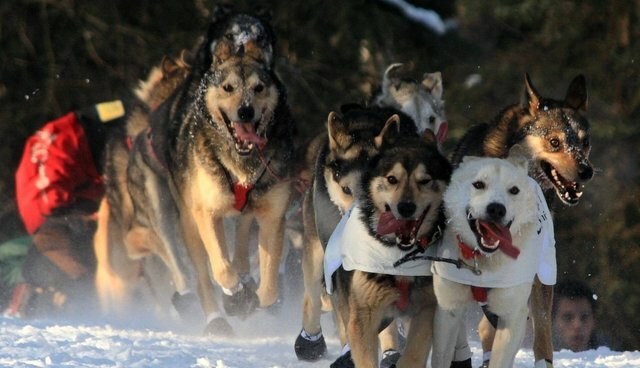 That allows mushers to pull off the trial to snack their dogs and rest without the competition knowing where they were. They cannot read each other's GPS location. Mushers and their dogs have favorite ways of running but all follow some pattern of running for a set number of hours and then resting a set number. Vary your rest times too much, too early and you risk tiring your team out of contention. What makes this year's race difficult to figure are the different tactics of the lead mushers. Jeff King, first to the Yukon, did not take his 24-hour rest until he reached the big river. Does he have enough cushion to withstand the rush of mushers who have rested themselves and their teams earlier in the race? He is a four-time winner with a plan; only time will tell if it was a smart one. The Norwegian Robert Sorlie has a very fast team trained to make long runs at steady speeds between shorter rests than the Americans train their teams to do. This year the two-time winner's dog team appears capable of running fast for long periods. They might just pull him to victory number 3. Any one of three or four other mushers including Ally Zirkle could still win as well. It depends on the dogs. These are Alaskan huskies bred to run. They are highly variable in terms of coat and ears and size but all to one degree or another want to, in the words of Martin Buser, run fast and pull hard. They can be called purpose-bred dogs. Between the most successful mushers and their dogs is a bond of understanding and commitment forged from hours spent together in races and in training. The musher is the coach; the dogs are the players. It used to be the case that one or two leaders were the norm, but now, every musher wants as many dogs capable of leading as possible. That takes pressure off the primary leaders and provides backup should one of the top leaders get sick or injured. Dogs are dropped or left at checkpoints because of illness, injury, or lack of speed -- so that they can't keep up with the team -- or desire. They are left at the checkpoint under the care of volunteers and veterinarians if they need medical attention for shipment back to a holding facility in Anchorage where they are tended by prisoners. If they need veterinary care, they receive it there as well. In the past, dogs were carried to the checkpoint on the sled; the caboose provides them with a better ride. Last year in a horrible accident, a dropped dog died while awaiting shipment to Anchorage. As has become too common, the tragedy was seized upon by race critics as another sign of the event's perfidy. But enough! For now, I'm going to enjoy the race and hope nothing bad happens to humans or dogs.